Lahinch is best described in the literal translation of its name, "Leath Inis", or the "Half Island." 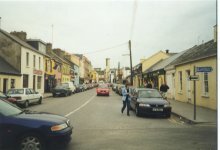 This colourful description of the village is borne out by the Atlantic to the west, the Inagh River to the north and the smaller Moy River to the south. The official name, in Irish, is Leacht Ui Chonchubhair, or O'Connor's Cairn, erected in memory of one of the O'Connor Lords of Corcomroe who was slain by his nephews in 1471. The site of this grave is believed to be at the end of the Main Street. From pre-historic times people have lived here among the sand-hills. There are several earth-forts nearby; the finest one is on the northern side of the hill above the village on the main road to Ennistymon. Lahinch developed from having just a few cabins in the eighteenth century to having a population of over one thousand people in 1835. However, no significant development took place in the early nineteenth century as the sea front continued to take a severe battering from the Atlantic gales. Lahinch's popularity and fame depend on two features. First and foremost is the mile-long beach of golden sand stretching along in front of the village, promenade and sandhills. With the growing popularity of sea bathing and the arrival of the West Clare Railway in 1887 people began to arrive in unprecedented numbers. The village's secondary, but by no means lesser, claim to popularity and fame is its Golf Club. H.B.H. in the book "Holiday Haunts of the West Coast of Clare", wrote of Lahinch in 1891 - "its strand for length, width and evenness is not to be excelled in Ireland. The accommodation is excellent, neat and respectable, and so graduated in size and arrangement as to admit of being let at prices to suit the position and circumstances of all classes." Gertrude Crowe gives us a description of Lahinch in the "Times Weekly" of 1900 - "Lahinch, a restful picturesque spot on the west coast of Clare, retains much of its primitive old world charm. In the good times, it is celebrated for the assemblage of rank and beauty and fashion who resorted thither for bathing. An 1822 Guide mentions that the neighbouring gentry was in the habit of having warmly contested races on the strand." In September 1920, in reprisal for the Rineen Ambush, British troops set fire to many buildings in Lahinch, including the local dance hall near the Promenade. Garland Sunday, celebrated on the last Sunday of July, was an important day in Lahinch. The main street was lined with a variety of stalls and attractions. People came from all parts of the county and there were special West Clare excursion trains from Ennis and Kilrush. The closure of the West Clare Railway in 1961 was a blow to Lahinch but it maintained its popularity. A golden sandy beach, spectacular scenery, water sports, good accommodation and varied entertainment are some of the attractions that make it an ideal holiday location. It is also an excellent base for fishing, walking, cycling and pony trekking. Lahinch today is one of Ireland's foremost family seaside resorts.